Actually, MS Removal Tool is really old fake antivirus software that appeared in an earlier time. MS Removal Tool is such a notorious malware that has attacked and infected so many victim computer systems. What is MS Removal Tool exactly? How to remove MS Removal Tool completely? Is there an effective removal guide to terminate this rogue from the root off the computer? And now, MS Removal Tool is still distributed over the Internet thru some malicious sites or fake online scanners to harm more and more computers. Many people are looking for help to terminate this old and tricky malware threat all the time. Hope this post will be helpful somehow to keep your computer getting far away from this rogue. 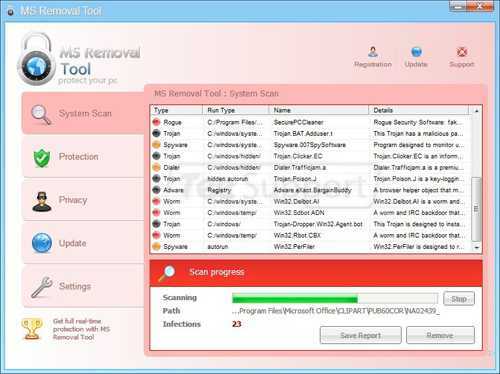 MS Removal Tool is actually a fake security tool that uses the name MS (Microsoft) to make people into thinking that it is a legitimate virus remover associated with Microsoft. However, it is not the fact at all. MS Removal Tool, like many other rogue antivirus and antispyware programs, is good at displaying fake security alerts and scan results in order to make you scare and think that your computer is infected. MS Removal Tool can be installed through the use of Trojans, virus or other malware that will install the program onto your computer without your knowledge or permission. When installed, the infection files will be created in a random named folder in C:\Documents and Settings\All Users\Application Data\, in XP, or C:\Documents and Settings\All Users\Application Data\, in Windows Vista and Windows 7. It will then be configured to start automatically when you login to your computer. If your computer is infected by MS Removal Tool, you properly get its pop-ups or its interface displaying at each Windows startup. MS Removal Tool eats up lots of system resources, which makes the victim computers totally influenced that everything becomes slow and even inaccessible. Moreover, MS Removal Tool may collect your personal information while it runs on your computer. Your system and your financial information are at high-level risk totally! Intercepting programs that may compromise your private and harm your system have been detected on your PC. Click here to remove them immediately with MS Removal Tool. Your PC is infected with dangerous viruses. Activate antivirus protection to prevent data loss and avoid the theft of your credit card details. Click here to activate protection. Warning! Your’re in Danger! Your Computer is infected with Spyware! In no circumstance should you try to download, install or purchase MS Removal Tool rogue! Removing MS Removal Tool immediately is the only action you should take without delay. How to Remove MS Removal Tool Rogue Completely? However, if you are not very good at handling the Windows Registry which is a critical component of your system, please do not take the risk to remove MS Removal Tool yourself. Instead, please get help from experts of Tee Support to fix your problem asap. 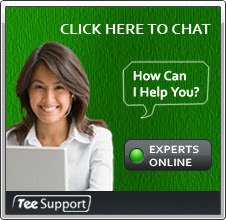 If you need help, please click here to live chat with Tee Support online experts for immediate help now! Thanks so much that you like it! Just try to share and provide information that can really help others from the bottom of my heart.